Do you love the artsy Polaroids? These are statement pieces, right? Do they talk to you? Should I draft an artist statement? Nope, I was just playing around. OK, here's the story. I figure why not. When I got home I grabbed an empty Polaroid 600 film cartridge and went into a dark bathroom. 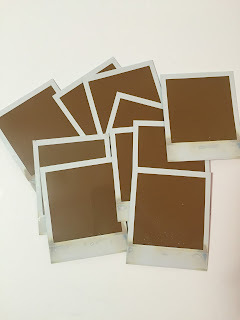 I extracted all 10 undeveloped photos from the old cartridge by feel in the dark & reloaded them into the fresh cartridge. I loaded the re-loaded cartridge in a fresh camera and one of the photos popped out! It worked. I then went around my yard taking photos. The results are above. As expected...seriously, I expected this, all of the film emulsion packs were dried like a desert so the film didn't develop. Even though the film ejected no emulsions spread across the photo to initiate the development. This was an actual Polaroid pack of film, so its at least ... maybe 10 years old? No way it will be any good unless it was cold stored. Moral of the story boys and girls? If you plan on buying real Polaroid film online, it probably not going to be good unless you KNOW it's been stored properly & from a reputable source. Even then the cartridge battery may be dead. If you have a Polaroid (not talking about Instax here) then do yourself a favor, buy film from the Impossible Project. It's quirky, but it will be good.